She stands for all that is good and righteous. She battles evil wherever she finds it. She's the defender of those who cannot defend themselves. She's Super J! This masked superhero--who dreamed of being a wrestler or a comic book hero since she was a tot--has combined both dreams while making quite a name for herself in the Chicago area. Her unique look and style has been impressing fans and competitors alike. Look! Up in the sky! Is it a bird? A plane? No...it's SUPER J! Defender of those who cannot defend themselves: Super J! 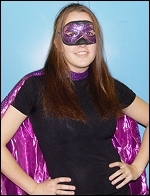 Super J strikes a superhero pose at G.L.O.R.Y.Con 2004. Super J flies high as she prepares to take her male opponent down to the mat hard! Super J poses with one of her biggest allies: fellow G.L.O.R.Y. Girl Syren. Super J is a favorite of the crowd...especially the younger fans. But who wouldn't cheer for such a lovely superhero?! How It Started: I was interested in wrestling when I was younger and I loved Miss Elizabeth, but I always wanted to do more than just manage. My parents used to yell at me for running around the house with a towel around my neck claiming to be a superhero/wrestler. They told me "girls couldn't wrestle". I received a tape for my 5th birthday with Wendi Richter and Leilani Kai on it. I decided then and there that when I was older, I was going to be a wrestler. I stopped watching for awhile but got back into it in high school when a friend made me watch a WWF PPV. I was instantly hooked again and I remembered my dream to wrestle! I searched for a wrestling school for about two years before I found PCW when I was 17. My best friend and I signed up the day after seeing our first PCW show and noticing that they actually had girls that wrestled rather than just T&A. I always knew women could do more and now I'm out to prove it! Gear: Black and purple vinyl and velvet shorts, with a vinyl bustier, purple kickpads, a purple cape and mask...and I am working on getting more superhero outfits! Titles Held: First-ever PCW Ladies Champ. Biggest Win: Pinning Mia Martinez for the PCW Ladies Title. Worst Loss: To Lexie Fyfe in ELW. I think she beat me in less than five minutes! Favorite Type of Match: Mixed Tag, Intergender and No DQ. Favorite Moves/Holds: Test Of Strength...I'm undefeated! ; Tilt-A-Whirl Headscissors; Inverted Backbreaker DDT; Super-plex. Finisher: "Up Up and Away"; "Purple Tornado". Biggest Allies: Syren; Kayla; Miss DeVille; Synndy; ALF; Luscious Lily; EZ; Rick Knight; MC Trip C; Tristin Hayze; Brandon Bishop; Jimmy Blaze; Dave Storm; everyone who has helped me out at some point in time! Most-Hated Enemies: Sensational Sascha; Michelle Morgan; Samantha Hart; Ryan Kross; Justin MacIntyre; Natasha Crane; Synn; anyone who dares to mess with me! Career Highlight: I can't pick just one highlight, but I think GLORYCon 2004 was close! It was my first time wrestling on the East Coast and everything was so different! Favorite Wrestlers: Christian; Lance Storm; Chris Jericho; Mick Foley; Molly Holly. Wrestling Ambition: To keep improving myself and taking it as far as I can...but still have fun! I am an art major in college.....My hobbies include working out, hanging out with friends, chatting online, posting in my live journal (yeah I'm a dork), watching movies, reading, drawing, writing and anything creative!.....I speak French almost fluently.....I play guitar, bass, drums and I'm learning violin.....My favorite band is Veruca Salt.....My favorite movie is Kill Bill. I LOVE Tarantino!.....If I weren't in wrestling, I would play bass and sing in a punk band.....I have a pet fish named Julius who came back from the dead. Visit the super-site of...: Super J!